Many people are afraid of this card, mostly because they don’t understand it. 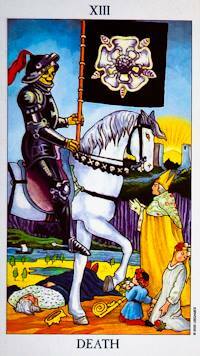 I most always interpret the Death Card as the sign of rebirth and rejuvenation. Perhaps the “Party is over,” and you are ready to get back to work, back on track, back to the gym, back to the basics. Whatever you are getting back to, know that the timing and energy are perfect for this. It's time. Now is the moment to close the doors to that which is in the past, good and bad. Hold on to the lessons and the memories, but let go of the hurt or the attachments. New energy is on its way in. I can almost hear the sigh of relief being sung across the planet. In the event that you do experience an “unexpected” ending today, know that when the Death Card is present, the ending is purposeful and karmic...so let go of feelings of I coulda, shoulda, woulda. Know that this situation was out of your hands.